José Mendez & Co.'s tobacco fields in Santiago, Dominican Republic. After a late and extended growing season, the tobacco harvests of the Dominican Republic are finally wrapping up. Excessive rain from September to December of last year made it nearly impossible for growers to plant or cultivate their tobacco on schedule. Much of the field activity was suspended, and in some cases, entire crops were destroyed. "This year, from September to December, we saw lots of rain," Manuel "Manolo" Quesada announced grimly at the ProCigar press conference earlier this year. "In my 56 years here in this country, I've never seen so much rain in four consecutive months." The growing season normally ends in February, but the heavy rains caused some farmers to grow tobacco well into May. "In November, the rainfall was almost five times the historical average," said Francisco "Don Quico" Hernandez, general manager of tobacco growing and long filler processing for General Cigar. According to Hernandez, the average rainfall in the Dominican Republic for the month of November is 2.3 inches. Last November, 11 inches of rain were dumped on the country's tobacco fields. Once the rains finally subsided in December, farmers were able to start planting tobacco. In an attempt to recoup time lost last fall, some farmers extended the growing season all the way to May. "We did early planting in the first week of November, about 100 acres," said Litto Gomez, who grows tobacco in La Canela, an area west of Santiago. "Right after we planted, it started to rain pretty much every day and our plants started to die. We started to replace them but there came a point where too much time had passed between plantings." According to Gomez, large time lapses between crops can cause inconsistencies in flavor and plant size, and he did not want drastic differences within the same harvest. "Because of that, I ordered the tractor to clean the fields," he said. "We replanted the whole farm at the end of December and from that time on, the weather was perfect for tobacco." Siegfried Maruschke concurs. Along with his father, Maruschke owns José Mendez & Co., an agricultural firm and primary growing partner with Altadis U.S.A., makers of the Dominican Montecristo and Romeo y Julieta brands. Luckily for Maruschke, the damage was minimal. "We only lost the seedbeds and some early planted fields," he said. "After this initial setback, we have enjoyed excellent weather and the tobacco plants have responded positively. The tobacco crop was somewhat smaller than normal, but of good quality." While the setback caused growers to keep tobacco in the ground all the way to this month—which is highly unusual—the subsequent dry weather was optimal for cultivating tobacco. "Almost all the long-filler tobaccos are in the curing barns right now," he said. "There are still some short-filler primings being harvested." Gomez, who's most famous for his La Flor Dominicana brand, isn't finished growing premium tobacco. He still has shade-grown Criollo '98 and Havana 2000 in the ground, and intends on using it for wrapper. Priming began last week. Right now, General Cigar has no tobacco left in the ground. Makers of major cigar brands like Macanudo and the nonCuban versions of Partagas and Cohiba, General completed its harvest in March and had tobacco in its curing barns as late as April 30. 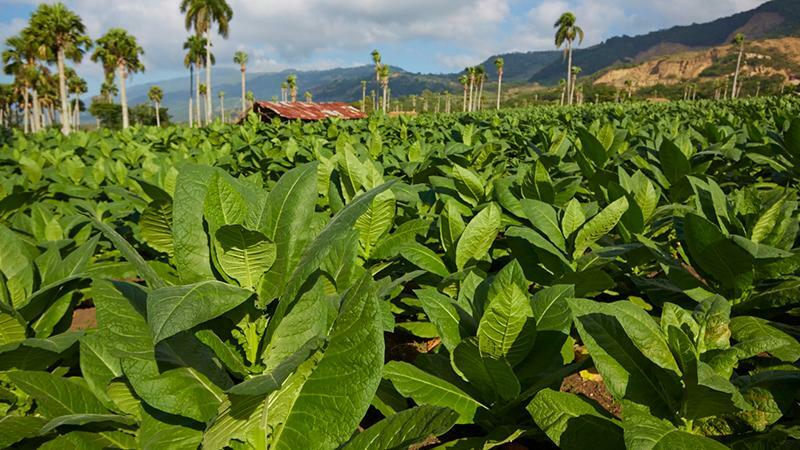 General grows its tobacco in the Mao region of the Dominican Republic. Despite the setbacks and late planting, José "Jochy" Blanco also believes that this season still produced a high-quality crop. A Dominican tobacco grower and cigar manufacturer, Blanco doesn't have any tobacco left in the ground, but his curing barns are currently full of Criollo '98, Corojo and Piloto Cubano—the primary tobacco varietals that he grows. Blanco points to La Niña as being responsible for throwing off the growing schedule. La Niña is a period of cooler ocean temperatures that can often result in irregular weather patterns (as opposed to El Niño, which is a period of warming). "This whole La Niña phenomenon delayed everything a bit," he said. "Even though we lost some tobacco in the beginning, the tobacco we grew is of very good quality," he said. The next planting for 2017 should begin in September. This article first appeared in the May 16 edition of Cigar Insider.